This week’s mixed media journaling exercise had several parts. The first part was to watch Byron Katie on Racism & Prejudice video clip, next to explore and process an instance where you haven’t completely forgiven someone in your own life, and then to make peace with the incident by given the other person radical compassion through empathy of the need that the person had which caused them to engage in the behavior they did which caused you pain. Tamara recommended not to use an incident with deep pain, instead use one that could be easily identified and explored. As I mentioned in earlier blog posts, I have been working on forgiveness and have had quite a bit of help from the Universe in bringing past hurts forward into my present consciousness. 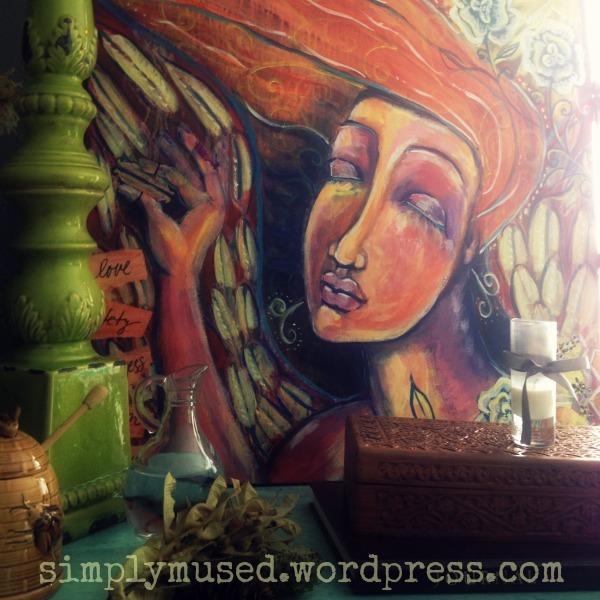 Last week, I took a live streamed painting class by Artist Shiloh Sophia titled The Honey Jar: Wet, Wild and Wise. This course was to explore your experience with your own sexuality and romantic relationships. I did not quite catch the theme of the class before taking it or I probably would have steered clear just because I don’t always agree with all of the “freedom” that people place on sexuality these days. I must say that I did enjoy the class overall and love the painting and conclusions that I came to throughout the process. I am bringing up this class because I believe that both of my latest pieces of art tie together. The symbolism in the painting has to do with my personal connection with my femininity and my expression of being a creative being on this planet. The orange colors in the painting have to do with the sacral chakra and wholeness and healthy energy that region of the body. Sexuality is something that I consider sacred and only shared within confines of safety & love. I used white roses in this painting because they symbolize sexual purity and it has been my experience that sexuality is a beautiful thing when explored at the right time as part of mature love. It saddens me to see children being directed to explore sexuality by their peers or adults too early when they should still be children an caught up in the world of magic and imagination. The sunshine symbolizes wisdom in sexuality–sharing that part of yourself in ways that lead to health and wholeness in life. The blessings of the class that I received were love, safety, sweetness, passion, and adventure. These words were varnished in. Now, to skip back to the Radical Forgiveness exercise. These days, it seems I only have but little incidents which arise in my romantic relationship. I am blessed. With that said, right before I was getting ready to do this journaling exercise, my husband coincidentally slightly hurt my feelings, and I used this process to understand where he was coming from in order to release my sadness completely. The little hurts are kind of like bee stings, but as I am the powerful bear, those stings are only minor irritations and I must remember that I am holding the honey. The love and life sustaining substance for the bees. It is what they spend their time, effort, and passion making. The barren tree symbolizes the old way of viewing the hurt. The words describe the blessing or positive energy you are sending to the person who has caused you the pain. Hopefully, these blessings are in the form of the filling the exact need that other person has (especially the energy behind their motivation in getting their need met). In this exercise, I blessed my husband with his need for strength, compassion, understanding, empathy and love. 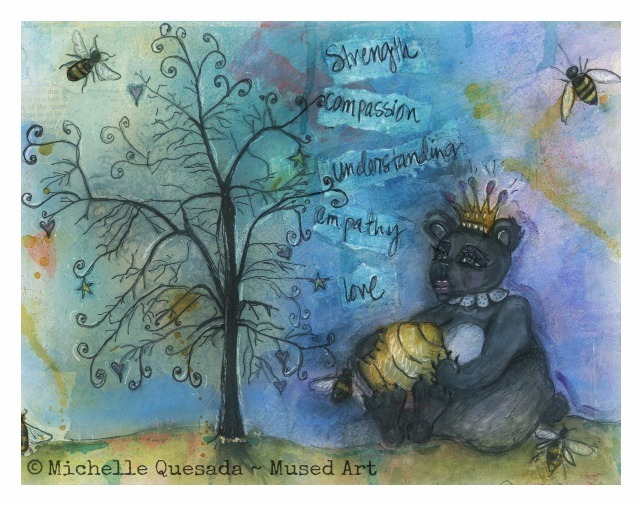 This entry was posted in Uncategorized and tagged Acrylic Painting, forgiveness, Hurt Feelings, Imagination, love, Mixed Media Art Journaling, relationships. Bookmark the permalink. Ah, my dear Michelle, your work is beautiful … as always. You bring up so much with this exercise. As you know, though our paths may be different we are choosing to travel and share them in a similar fashion. I could go on and on with this topic of what is for me our sacred sexuality and all that it invites when we engage with it – but I will spare you. 🙂 I will say this, though; my spirituality, sensuality and creativity dance together. And it is more important for me to view my sexuality through my sensuality which links to my creative expression and my gratitude to Spirit for this gift of life. There were many years when I thought I could compartmentalize them. And a few when I had to entertain one while the others were shelved due to life circumstances. I am no longer doing that and life has gotten quite interesting for this 58 year old woman! Love your art and love your light, my dear!